I’m not really sure how many times I can stress this, because it still doesn’t feel quite real to me just yet. I know the Home Opener is actually here; we’ve finally made it. The entire front office staff has been all-hands-on-deck as we prepare to draw the curtain for Friday’s Home Opener. 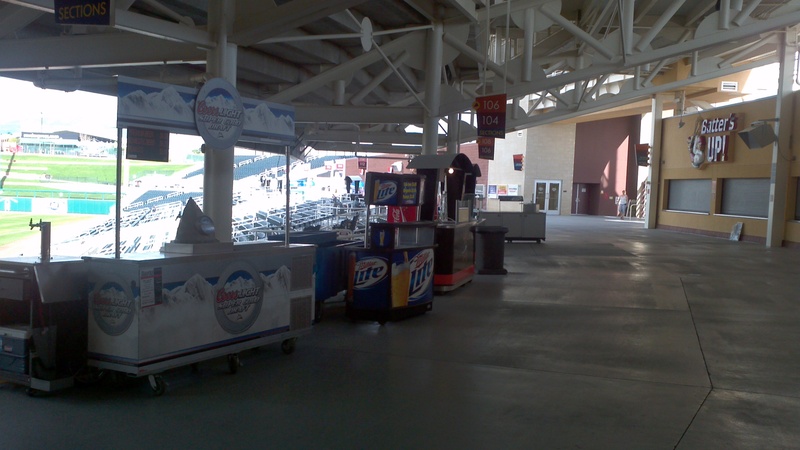 Finishing touches are being applied throughout Isotopes Park, from the fourth floor suites to the depths of the dugouts. 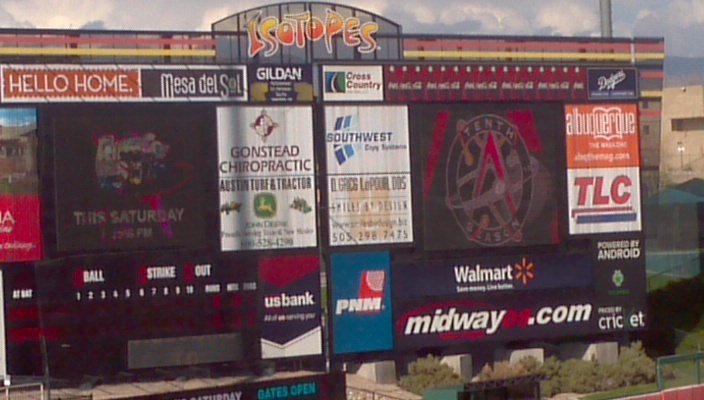 And Armed with hours of pre-season meetings and a corny, though insightful, inspirational video about giving our fans “the pickle” (http://bit.ly/HhbHw4), the Albuquerque Isotopes are ready to welcome everyone to The Lab for the 2012 season. 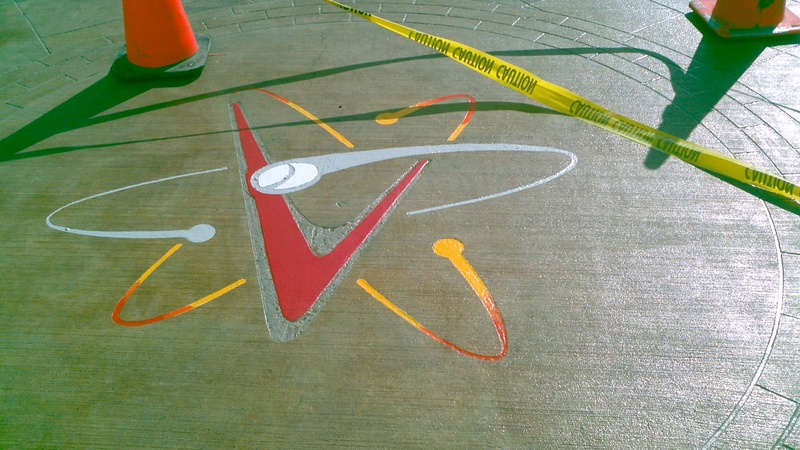 As you first approach the ballpark this year, you’ll see the famous Isotopes logo stenciled in the walkway. Maintenance has been hard at work to re-buff and re-paint this iconic mark of the team as we begin our 10th season. Professional baseball is officially back in Albuquerque when the lineup boards are up-to-date and set for the day’s game. As you can see from the picture, the standings aren’t ideal as of yet, but like the old adage says, “the season is a marathon not a sprint.” I’m sure the boys will bring their “A” game in front of 16,000 strong on Opening Night. In case the free scarves and beanies aren’t enough to fill out your ‘Topes wardrobe, the Pro Shop is fully loaded to meet all of your shopping needs. 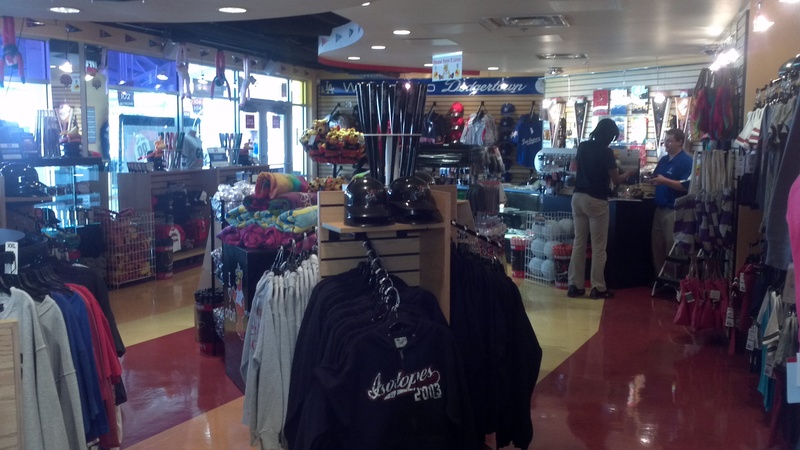 Let me restate that, and as the picture clearly shows, the Pro Shop is F-U-L-L-Y L-O-A-D-E-D. Trust me, it took an entire day just to unload and stock the hats, so you can imagine the amount of great merchandise waiting on our shelves. As you make your way around the concourse you might notice our huge statue of Captain Morgan. The Captain’s there as a friendly reminder about the incredible deal in our new “small group” section, the Captain’s Corner. 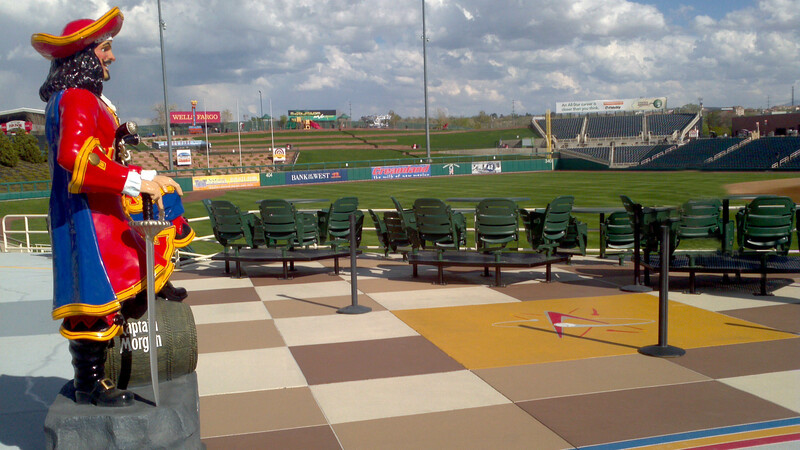 This seating area is perfect for friends and family to enjoy the game in their own “VIP” section of Isotopes Park. Saying the view from here is incredible would only be an understatement. Now that Media Day has come and gone, our Creative Services staff is well equipped with “fascinating” information on this year’s ‘Topes roster. We have the inside scoop on all the players’ preferences for topics like “favorite superhero,” “least favorite animal” and my personal favorite, “what actor would play YOU in a movie about your life.” Stay tuned to the video board throughout the game to find out these entertaining (and sometimes revealing) answers. A trip to The Lab wouldn’t be complete without venturing out to the Fun Zone. 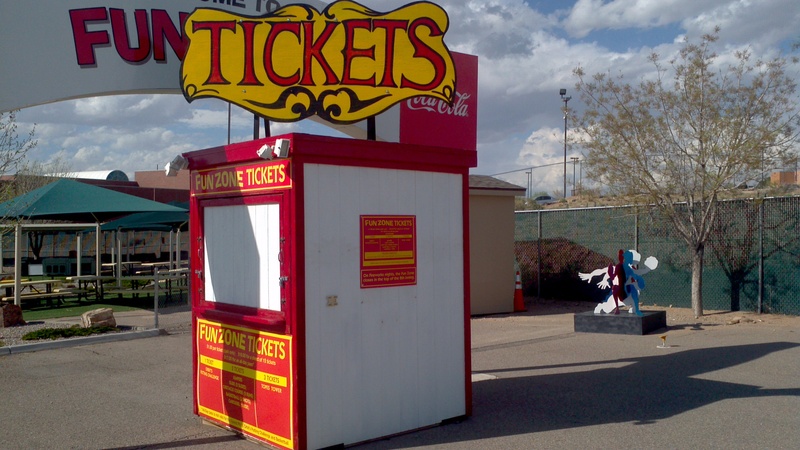 Our Stadium Operations department has left no stone unturned in their pre-season upkeep, and as the picture shows, have recently finished adding a fresh coat of paint to the ticket booth. It’s perfectly acceptable to be a kid again (at least at heart) and spend an hour or two in the Fun Zone this year. Last, but definitely not least, the centerpiece of baseball, our home field diamond. Pretty ain’t she. While it’s a 365-days-a-year job to maintain this piece of artwork, the past two weeks have been the icing on the cake to ensure the field looks picture perfect. And judging by the image below, it does. So let the final countdown begin! Roughly 32 hours until the soothing voice of the PA announcer welcomes you back for another season of the greatest sport on the planet. The ballpark. 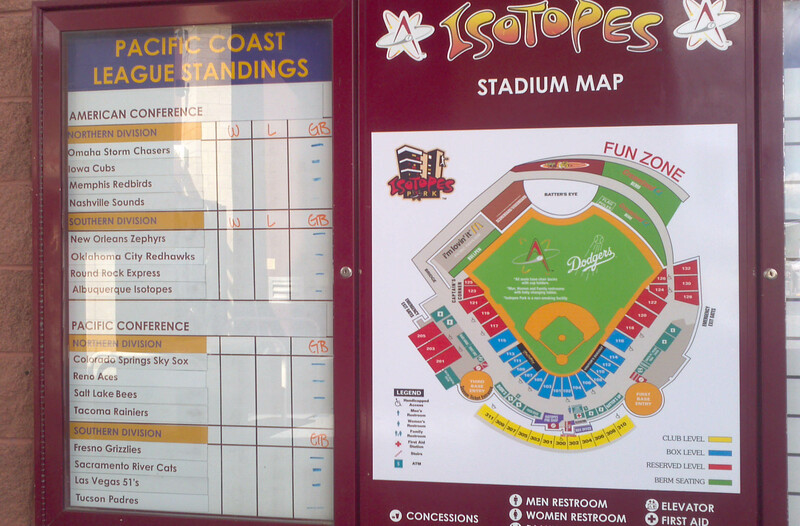 Isotopes Park. The Lab. Whatever you call it, we guarantee our 10th season here as the ‘Topes will be the best. It had been a long time coming when the Dodgers optioned outfielder Trent Oeltjen to minor-league camp after Saturday’s 9-3 win against the D-backs. Oeltjen was vying for a roster spot in a crowded Dodgers outfield that included four players ahead of the former ‘Tope, perhaps most importantly versatile fielder Jerry Hairston. Even so, Oeltjen didn’t make it easy on the Dodgers after batting .289 this spring and scoring two runs in Saturday’s exhibition game. But despite the solid performance, Los Angeles’ roster couldn’t support a spot for the outfielder. 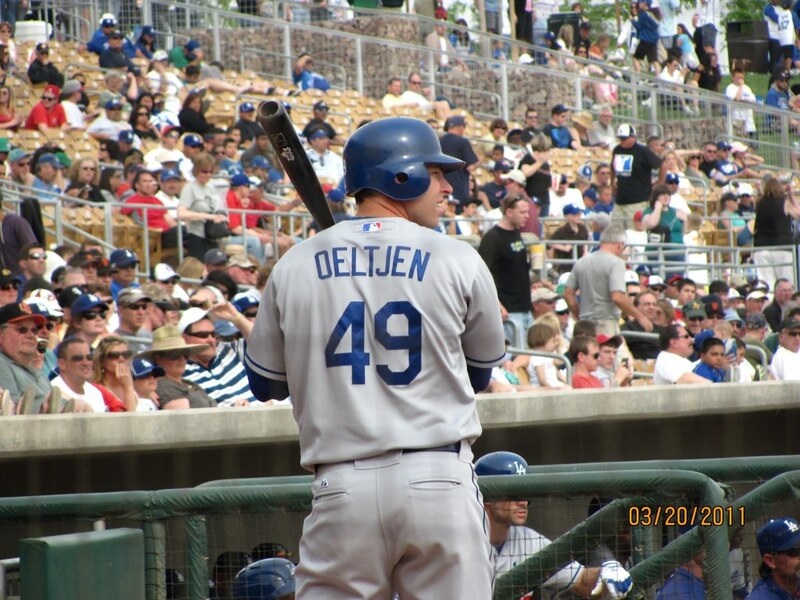 Oeltjen has appeared in 99 big-league games since his MLB debut with the D-backs in 2009. He batted .220 during that tenure, most recently dropping to .197 through 61 games with the Dodgers in 2011. Conversely, the outfielder racked up 149 hits in 465 at-bats (.339) with the ‘Topes last season, the highest among all Isotopes with more than 55 games for the Triple-A club. The roster move leaves the next and near final Dodgers transactions to involve an infield position between former ‘Tope Justin Sellers and non-roster invitee Josh Fields. Sellers’ performance has fluctuated during spring training and currently includes a .308 batting average, while Fields got off to a hot start before recently cooling off to hit .273. Stay tuned for more up-to-the-minute roster updates as the ‘Topes prepare for the 2012 campaign beginning April 5 at the Omaha Storm Chasers. Fans can begin to redeem their season ticket plans starting on Monday, March 26 at 10:30 AM through March 28. With a great schedule ahead, you definitely don’t want to miss a game. Club Read just kicked off with some great incentives for kids to crack open a few books this season. Dion’s Pizza and your ‘Topes will be giving away some awesome prizes to participants. With the Lobos beginning play, our stadium operations crew has been hard at work sprucing up the stadium in preparation for our home opener. The field is starting to look great and it kind of feels like baseball season around here again. Speaking of that, the home opener is less than a month away when the ‘Topes take on the Omaha Storm Chasers on Friday, April 13 at 7:05 PM. Minor League Makeover starts on March 20 when the ‘Topes grounds crew will begin touching up Belen’s field. Home Depot has also joined the action and donated supplies for the project. And also in the office, we’re all dialed in for some NCAA March Madness, which means ’round the clock “expert” talk about basketball. Even when you haven’t been watching any of the season. 1. The “No That’s Not Going To Happen” Card: Don’t be THAT guy that reads over other people’s bracket and quickly points out that “No! That pick will never happen!” I don’t care how many hours of “Bracketology” you watched, you’re not the Schwab for a reason. 2. Bringing Up Others’ Brackets Just To Talk About Your Own: It’s the same rules as Fantasy Football; everyone wants to talk about their team, but no one cares, AT ALL, about anyone else’s team. Please don’t come strike up a thrilling conversation to hear the winner of my bracket when you have a 15-minute speech-of-the-century planned about that INTENSE 8/9 matchup. 3. Not Paying An Entrance Fee: I’m not condoning gambling, but if, by some far-shot chance, you’re involved in some exchange of money, goods or services for an NCAA pool, please, please, please pay the entrance fee ON TIME. Everyone knows that one person who keeps “forgetting” to ante up just in time for their bracket champion to lose in the third round. This, of course, is followed by “Well, I’m not paying now,” and 365 days to remember why you’ll never let that person join the brackets again. 4. Claiming You Knew That Upset Was Coming, And Not Putting It In Your Bracket: The list is long and frustrating; all those no-names that conveniently remind you of your bracket being destroyed. And then there are the teams that actually destroy your brackets. If you think Long Beach State is going to tear through the first few rounds and show up in the Final Four, then by-goodness, PUT IT in your brackets. I’ll entertain your “I knew Butler would win” rant as long as you have it in ink. If not, the next upset will be coming from you as you’re not allowed to watch the games with the rest of the group. 5. Picking UNC/Duke: ‘Nuff said. 6. Putting All 1-Seeds In The Final Four: This is self explanatory. Sure, they’re one seeds for a reason. And sure, they have the easiest path to the championship. But no, you aren’t allowed to pick all four in the Final Four. I’ll give you two teams…heck, I’ll even give you three of the one seeds because I’m in a good mood from wearing jeans to the office today, but not all four. This just ruins any madness from this tournament when you pick the “best” teams to beat everyone else. I vote you let your hair down, live a little, and put that double-digit seed in the Final Four. Plus, you’ll have legitimate bragging rights about it (see number 4). 7. Informing Everyone That Your School Will Win It All: I’m sure your die-hard dedication to the alma mater will propel the team to an amazing run, blowing out every opponent along the way. My own Norfolk State is playing the two seed Missouri? Laughable. Just don’t. We all know you have insider news into your school you once went to for a few years and might have said “hi” to the basketball coach once while you were there, but don’t try to convince other people a 14 seed with an 18-16 record is a sure bet to win it all. 8. Pretending Not To Care: This is by far the worst move in the history of NCAA March Madness. No matter how little you know about basketball, or even sports in general, you DO care about this thing. Don’t be the killjoy that is “above” buzzer beaters and upsets. I’m not saying you’ll lose friends for pretending not to care, but you might find your weekend schedule quickly opening up. All that being said, opening day can’t come soon enough. With great happenings around the office and a little Madness on the side, we’re finding ways to keep ourselves entertained until the first crack of the bat. Just don’t let it come from me when someone violates a March Madness mishap. It wouldn’t be a proper release of something special without early morning campers and winding lines of eager fans. Oh, and sub-freezing temperatures too. 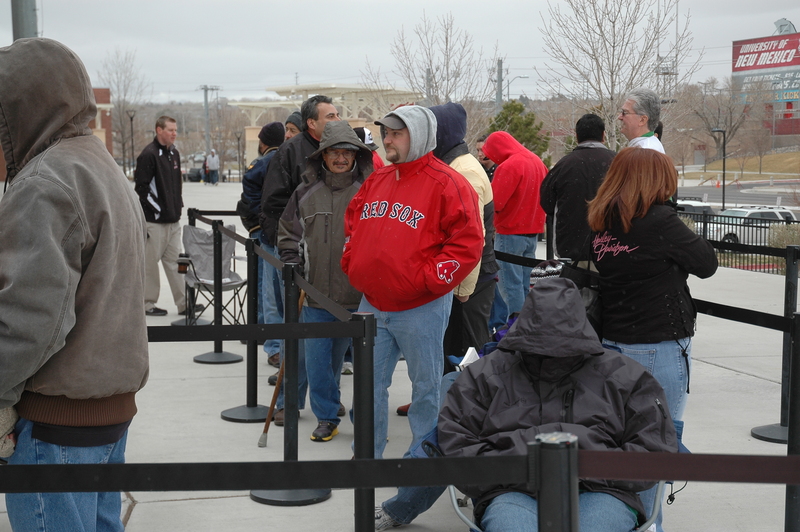 Bundled in everything from boots to beanies, Isotopes fans lined the front of the box office, counting down the seconds until 10 AM and the release of individual game tickets — Counting seconds because it’s impossible to think minutes when you’re being pelted by snow. But even that wasn’t enough to drive people away from laying hands on this year’s freshly printed passes. Dave Christenson, who staked out the very first spot in line, arrived to Isotopes Park early this morning to purchase his perfect seats for the upcoming season. Which is no easy feat in this inconsistent “Spring Training” weather. “Maybe we’ll start a few days early next year,” Christenson joked. 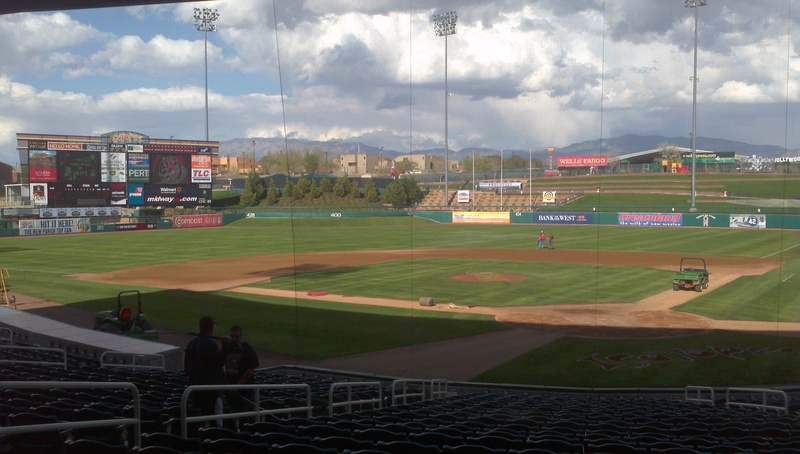 For fans, the pre-ticket wait has taken on the persona of baseball at Isotopes Park, where the atmosphere is fan friendly and you can’t help but enjoy yourself. Likewise, Christenson and company have made the best of the chilly mornings, finding ways to pass the time until the box office windows finally open up. Christenson can expect to see some familiar faces if he braves the cold again for the 2013 season. Long-time opening-ticket veteran Tom Kieffer has been purchasing tickets during release day since he moved to Albuquerque. Besides bundling up Saturday morning, Kieffer also wore the expectation of recognizing a few fans while he waits to claim his tickets. 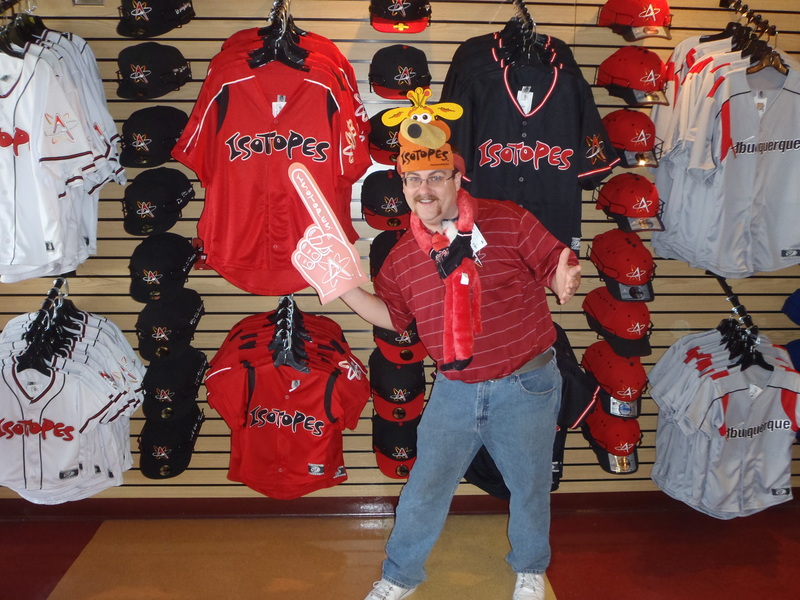 Excitement for opening day seemed to be a common theme throughout ‘Topes fans, some looking forward to post-game fireworks and others just wanting the gates unlocked for opening night. And if you were not one of the fans bold enough (subbing in “crazy” is also acceptable) to triumph over the elements on Saturday, fans like Christenson, Eagan or Kieffer still happily invite you to come join them at Isotopes Park for a game or two this season. And if that happens, 6 AM might not be early enough for tickets.